‘Sweet’ or Genovese basil has a subtle peppery flavour which gives way to a slightly sweet, aromatic flavour. When used in cooking it should be added at the end; as heat removes the flavour and cooking it for too long makes it bitter. 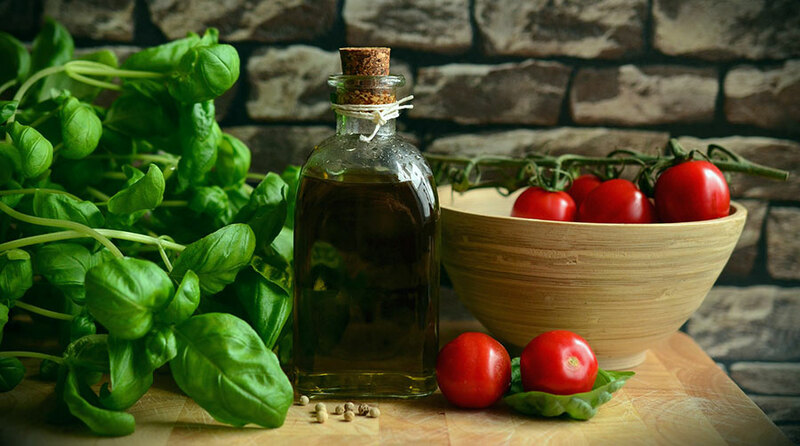 Basil, is extremely popular in Italian cuisine but is notoriously difficult to keep fresh, turning black and wilting at a most astonishing rate. However we have ways of keeping it fresh. Hand’s down the best way to store basil is to put a bunch in a glass or jar filled with water, like you would flowers. You can then cover it with a plastic bag and keep in the refrigerator. Basil kept this way will stay vibrant and green for up to a week. The best method isn’t always as practical as one might like. We did our homework to find that there’s a second-best-but-still-completely-serviceable choice and that is to store it like salad greens, wrapped in paper towels and put in a plastic bag. This keeps the leaves hydrated but not wet or damp. Want to keep your basil around for more than a few days? Our favourite method is to quickly blanch it (like 2 seconds TOPS! ), pat it dry and blend it with just a bit of olive oil. Pour the purée in ice cubes trays to freeze them. Once frozen transfer them to one of our vacuum containers. Removing the air from the container will reduce the risk of frost and keep your basil field fresh for more than a year. Temperature is key, so when growing basil outdoors, remember it’s very sensitive to cold and even the lightest frost will kill it. The trick to how to growing an abundance of basil is to harvest it often. The more you harvest, the more the plant will grow. When harvesting, pinch off the stem right above where a pair of leaves are growing. After you harvest, two more stems will start to grow, which means twice the leaves next time you harvest! Once the plant flowers, the leaves start to lose their sweet flavour. Removing the flowers, restores the flavour in a day or so. Granted you’ve made it to this point you should have a pretty steady supply of basil do deal with. Soon you’ll be honing your storage techniques and showing us a thing or two.